Hello everyone, welcome. It feels like ages since I have actually written a blog post. This might, at first be confusing as I have still been posting. However, I have been out of sorts for a while and the posts you have been getting were mostly written a while ago to cope with times when I am unwell. However, the eagle-eyed of you will probably have noticed that there has been a drop in frequency. And with that in mind I felt it was appropriate to write a post directly to the readers just about what is happening on this site. Also, I need to give credit for the title of this post. 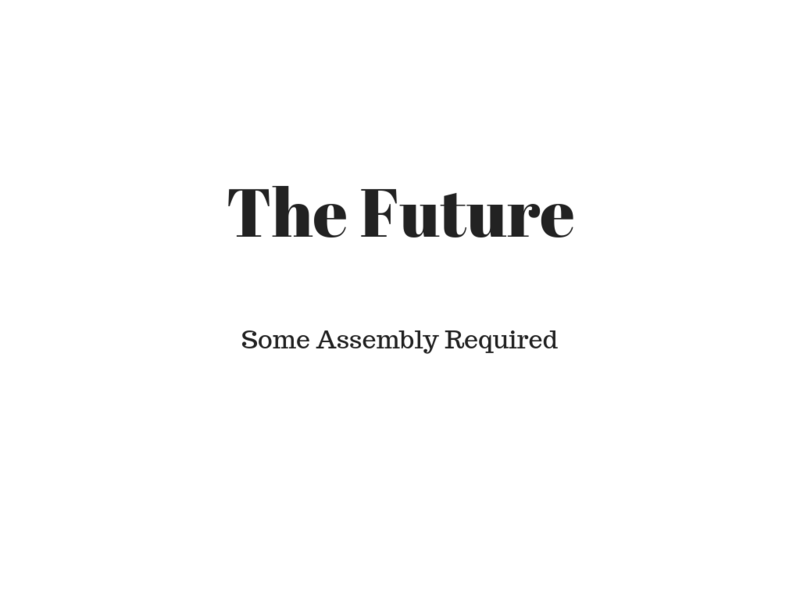 I heard the phrase “Someone should have marked the future ‘Some Assembly Required”” in a movie. I cannot for the life of me recall which one. It might even have been the TV show Babylon 5. Anyway, it felt appropriate for the post and it felt necessary to make an attempt at crediting the source. If someone can tell me what it is from, I will do exactly that. The net result, however, is I have less time to sit at my computer, and less time to play games. So, some changes needed to be made. First and foremost, I decided it was time to drop the posting schedule to one post a week. This has been part of the long term plan for a while, so this felt fine to me. I then started thinking about the creative project I was working on. I have been working on the first draft of a novel (and you can see what I mean by first draft on THIS post from October) however, as much as I was enjoying working out the overarching plot (even after rethinking as I felt elements were weak) I was hitting a bit of a wall, and when that happens there is only one alternative for me. Do something else. You see, I don’t subscribe to the idea of writer’s block. I realise people do “get” it but in my mind it is no phenomenon unique to writers. It is simple boredom or frustration with a task or chore. In a workplace, you push through as you must. In creative work, that is one solution though you might then spend a while doing rewrites and edits to correct forced prose. However, as I said, the solution for me is the solution for any boredom and that is to do something else. And it made sense to do something tied directly to this website. If you are a regular, you will know that I do regular reviews for products on the Storytellers Vault Website. This is a community content portal for World of Darkness games, including Vampire: The Masquerade and Vampire: The Dark Ages, which are my games of choice. I don’t think it is unfair to say that in the Vault community I have established myself as credible and fair as a reviewer, but more importantly, more than a few people know my name. For this reason, and because I love preparing roleplay games, I decided it was time to turn my hand to producing Storytellers Vault Products. The first one is being worked on just now. I am going to be producing one book in the first instance, with the view to creating other books of similar format. That being I wanted to create a product that is geography neutral, meaning whatever is within can be used by any Storyteller in any location. Each product will contain One or Two detailed NPCs to include in a game, including character sheet, Biography, Motivations and all of their assets/enforcers/allies/etc. Basically, everything that character has direct access to, be it a financial empire or an organised criminal gang, will be detailed in the book. So folks will get access to one or two such characters in each work. Not only that, I intend to have an “Off the Shelf” adventure included as well using at least one of those characters (more likely both). That being said, anyone who has read my Games Master Toolkit Posts or my Quest for the Perfect Game Posts knows that I don’t favour pre-plotted games. Rather, I prefer writing what has gone on before and why, and then listing where clues and people could be, or what players could do to find stuff out and then just let them loose on it. And that brings me to the name I am going to be using for this series of work. So, when I am not doing website posts I am writing stuff for Some Assembly Required. As that is the focus of my freelancing at the minute, the nature of this website will naturally focus more on creative writing stuff, storytelling stuff and roleplay stuff. I’m not dropping boardgames, but the fact of the matter is that I get to play them less frequently anyway so they will naturally become less of a presence on this site, though they wont disappear as I still love them. You’ll just see more thoughts on roleplay, writing, general musings from the perspective of a writer and stuff of that ilk. I know a lot of folks who are regulars tend to avoid the roleplay posts. I hope you’ll stick with me for the other stuff and have a look in on my other work from time to time. That’s all from me just now, all the best, happy gaming/writing! I think posting once a week is still great. If you can post more often, great otherwise you do you. It’s hard to make your freelancing work your number #1 priority when you have a full time job now. Hang in there! Your readers will stick around.